Sunon MB40201VX-000U-F99 - Computer, cooling, hardware & accessories with discounts direct to you. Sunon MB40201VX-0000-F99 40x20mm, 12 volt Super High speed fans. NEW model number and direct replacement for Sunon KD1204PKVX MS.M and Sunon KDE1204PKVX MS.M fans. These come with three 12" bare lead wires, the third wire being the LOCKED ROTOR ALARM. Select an OPTIONAL CONNECTOR with the desired WIRE POSITIONS from the menu, above. Direct replacement for fans in Cisco Systems Catalyst 2950 Ethernet Switches. Also used Dell, Netgear and other hubs and switches with fans equipped with 3rd wire locked rotor alarm function. Size, Inches................................ 1.60. " X 1.60" X .80"
Corporate or Valid Business Checks ONLY. PLEASE CONTACT US BY EMAIL OR TELEPHONE FIRST. WE NEED TO ENABLE THAT OPTION IN THE SHOPPING CART BEFORE YOU CAN PLACE YOUR ORDER. 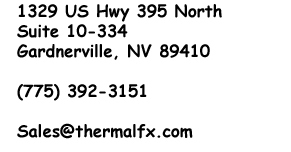 Please make payable to "THERMALFX, INC."
We offer shipping by UPS, United States Postal Service(USPS) and FEDEX. In the interest of providing the most cost effective and timely delivery of products, we reserve the right to ship by USPS, UPS, FEDEX or other carrier, AT OUR OPTION, and as we deem necessary. We may use any of these or other carriers as an alternate or substitute for the carrier you actually select during checkout. If we do excercise this option, we will select a class of service that is at least equal to or faster than the method you selected. You can select your choice of shipping options in the drop down window during checkout. We endeavor to ship orders the same day we receive payment confirmation, or on the next business day. We process and ship orders as we receive them, without delays. We guarantee to ship all orders within 24 to 48 hours of payment confirmation, Monday through Friday. We do not ship on Saturdays. USPS Express Mail next day and FEDEX Standard Overnight delivery are available if your order and payment are received BEFORE 12:00 PM Pacific Time, the same day. FEDEX OVERNIGHT orders placed on FRIDAY, will be shipped the same day. However, there is NO SATURDAY DELIVERY OPTION available. Orders placed Friday will likely be delivered the following Monday, if it is a regular business day. Orders of 10 pieces or more requiring custom termination or connectors may be delayed. FEDEX Express SAVER and FEDEX 2 DAY are NOT expedited services and will be processed in the order in which they are received, and shipped within 24 to 48 hours. All FEDEX, UPS NEXT DAY and Express Mail Overnight/Next Day Services are exclusively available to destinations where air and ground transportation networks make it possible for FEDEX, UPS or USPS to provide the overnight delivery service they guarantee. Each USPS Post Office establishes its own network of destinations for overnight Express Mail. For those areas not on the next-day network, USPS offers Express Mail Second Day Service. Your local Post Office maintains an Express Mail directory for your ease in determining if your destination can be reached overnight. We use USPS for International Shipping. The ONLY METHODS we will use are USPS GLOBAL EXPRESS International or PRIORITY MAIL International. For orders over $250.00 or of extreme weight, we can ship by UPS or FEDEX and bill it to your own account. There is a small handling fee for this service, so contact us by telephone or email FIRST, for details. We are strictly an internet-based operation and do not have the faciities or capability to provide for in-person pick up or will call.